“Sweden has produced a proud list of impressive dramatic sopranos: Olive Fremstad, Nanny LarsénTodsen, Ellen Gulbranson and Birgit Nilsson, to name but a few. Unfortunately, one of them, Göta Ljungberg, had a rather short-lived recording career. It is quite remarkable that this superb soprano, who was equally impressive as an actress, achieved such limited attention. As with most of the Nordic singers the sound of Ljungberg’s voice is not ‘italianate’, meaning you will look in vain for Mediterranean sunshine. Hers is a clear and pure voice, impressing by a forward projection and incisiveness of tone; (John Williams spoke of a focused, laser-like tone). This kind of voice is ideally suited not only to the demands of the Wagnerian repertory but also to Strauss’ Salome. It is not surprising that this part was Ljungberg’s greatest achievement in her career. Her voice may have lacked a certain warmth but she was a strong personality and sang the part magnificently with an above-average enunciation. As Salome she was only equaled by Ljuba Welitsch, Marjorie Lawrence (in French) and Maria Cebotari. All her Wagnerian should not be missed. Göta Ljungberg was born in Sundsvall and studied with the renowned Swedish vocal coach and physician Gillis Bratt. She took further lessons in Milan and Berlin with a number of teachers, among them with Mme Charles Cahier. She made her début as Gutrune in GÖTTERDÄMMERUNG with the Stockholm Opera in 1917 where she was engaged until her early retirement in 1937 (in the later years she frequently appeared opposite the young Jussi Björling). Subsequentely, she joined the Berlin State Opera where she not only excelled in Wagnerian repertory but also in roles such as Tosca, Santuzza and Elektra. She even appeared in operettas and musicals (e.g. in Benatzky’s DIE DREI MUSKETTIERE). 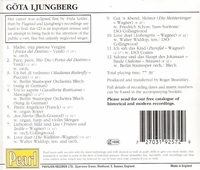 Ljungberg made her sensational Covent Garden début in 1924 as Sieglinde (opposite Gertrude Kappel, Jacques Urlus and Friedrich Schorr, conducted by Bruno Walter). Later she appeared there as Salome (her greatest success), Kundry, Tosca, Elisabeth and in the title role in Goossens’ JUDITH. She was under contract to the Met from 1932 to 1935 where she sang the Wagner roles as well as her thrilling Salome. She also created the role of Lady Marigold Sandys in Hanson’s MERRY MOUNT opposite the eminent baritone Lawrence Tibbett, Gladys Swarthout and Edward Johnson, conducted by Tullio Serafin.